Well, lovely people, Spring has sprung, and with it I feel my strength coming back after months of ill health. Not only that but I am thrilled to bits to have a poem in the Anthology of Yorkshire Poety, published by Valley Press. Click the link and see for yourselves, I am in the midst of exulted company, Carol Ann Duffy, our Poet Laureate to name drop just one. This has been great for my moral, which I have to say has been at an all time low. So, it is onwards and upwards from here. As to the onwards and upwards I have been working on my second novel, which after dozens of re-writes over a number of years I now consider to be finished. Yeah! Watch this space for updates on my poetry too. A few weeks ago Simon Armitage came to Barnsley to give a talk about his work. It was one event I could not miss, and what a splendid evening of poetry it was. 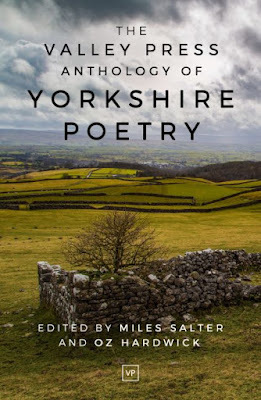 Of course I am in love with Simon Armitage, and can't understand anyone who isn't. 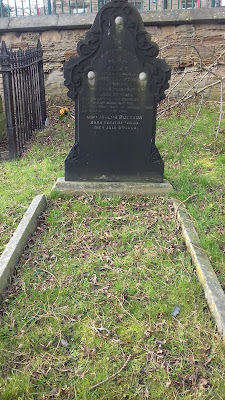 The other activity that has consumed me of late is 'heir hunting,' and to that end David and I have been trailing various graveyards around Barnsley looking for trace of my relatives. Well we have been very successful. Only two or three miles away from where we live is Elsecar, and there we found the grave of my Great, Great Grandmother and Grandfather, Ellen and Joseph Royston. In the same graveyard, that of Holy Trinity Church, is my Great, Great, Great, Grandmother and Grandfather, Sarah and George Royston, plus children they had, one of which, Walter Royston, is named on the grave as having died in Canada. So looks like I may have relations over there too. In Monk Bretton we found the grave of my Great Grandmother and Granddad, Annie Elizabeth and Arthur Clarke. So now I really do feel that I have returned to my gene pool. I have to say, I did shed a tear. It is a strange feeling meeting the past in this way. I now know that I come from at least four generations of Barnsley coal miners. No silver spoon as yet! I am now going to practice my pitch for my poetry which I will put before publishers in the near future. I hope all is well with you, and that you are feeling the wonderful effect of Spring too. I promise to write again soon to keep you up to date with my life around Barnsley, and beyond.